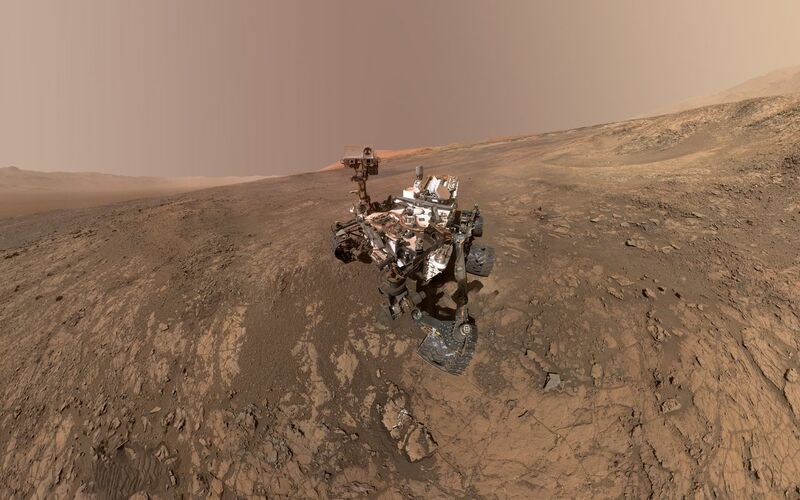 This self-portrait of NASA's Curiosity Mars rover shows the vehicle on Vera Rubin Ridge, which it's been investigating for the past several months. Directly behind the rover is the start of a clay-rich slope scientists are eager to begin exploring. In the coming week, Curiosity will begin to climb this slope. North is on the left and west is on the right, with Gale Crater's rim on the horizon of both edges. 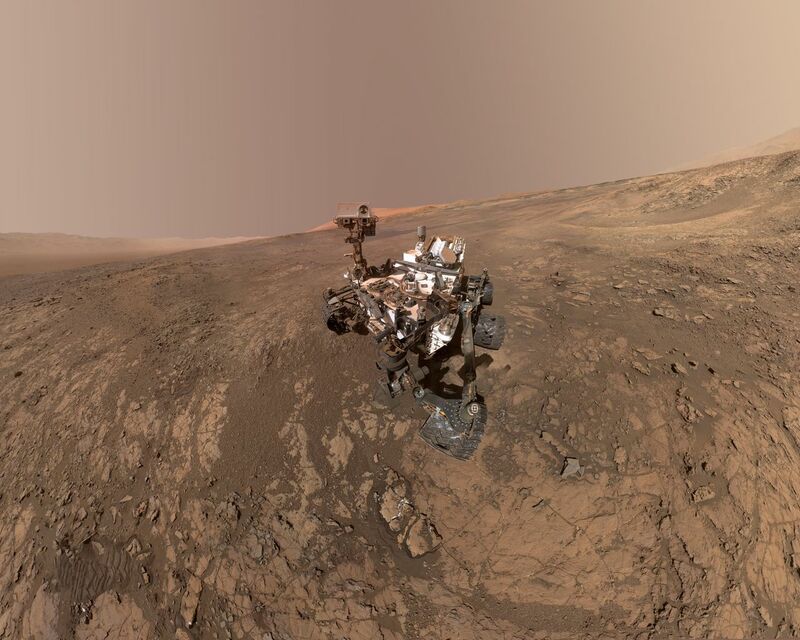 Poking up just behind Curiosity's mast is Mount Sharp, photobombing the robot's selfie. 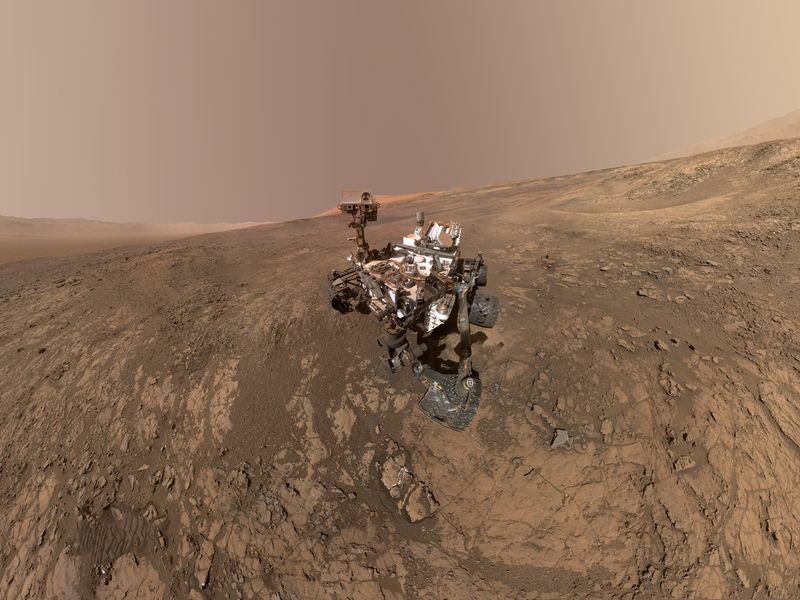 Curiosity landed on Mars five years ago with the intention of studying lower Mount Sharp, where it will remain for all of its time on Mars. The mountain's base provides access to layers formed over millions of years. These layers formed in the presence of water -- likely due to a lake or lakes that sat at the bottom of the mountain, which sits inside Gale Crater. This mosaic was assembled from dozens of images taken by Curiosity's Mars Hands Lens Imager (MAHLI). They were all taken on Jan. 23, 2018, during Sol 1943. The view does not include the rover's arm nor the MAHLI camera itself, except in the miniature scene reflected upside down in the parabolic mirror at the top of the mast. That mirror is part of Curiosity's Chemistry and Camera (ChemCam) instrument. MAHLI appears in the center of the mirror. Wrist motions and turret rotations on the arm allowed MAHLI to acquire the mosaic's component images. The arm was positioned out of the shot in the images, or portions of images, that were used in this mosaic. This process was used previously in acquiring and assembling Curiosity self-portraits taken at other sample-collection sites, including "Rocknest" (PIA16488), "Windjana" (PIA18390), "Buckskin" (PIA19808) and "Gobabeb" (PIA20316). Additional information about Curiosity is online at http://www.nasa.gov/msl and http://mars.jpl.nasa.gov/msl/. Photojournal Note: Also available is the full resolution TIFF file PIA22207_full.tif. This file may be too large to view from a browser; it can be downloaded onto your desktop by right-clicking on the previous link and viewed with image viewing software.